Aunties and cousins, war lords, princesses, uncles, ancient warriors, fortune tellers, pirates and fearless kidnappers. The Tashi books are full of wonderful characters! These are just a few of them. Tashi comes from a place very far away, and he arrived here on a swan. Tashi has a way with witches and warlords, and he's not afraid of giants or robber barons. Although he's small and not very old, he comes up with some cunning plans in tight situations! And he tells the very best stories. The Baron has the heart of a robber and the smile of a snake. He has gold teeth, and the only thing he loves is gold. He was once poor, but now has a huge fortune because he tricked an old banker out of his riches, stole money and hired pirates. Everyone in the village used to wonder where he kept his gold, until Tashi found out in Tashi and the Ghosts. The Baron is landlord of the house where Tashi's Aunt Li Tam lives, and Tashi's Third Aunt works for him as a cook. You can read about the Baron in lots of the Tashi books. The dragon is huge. He has scaly dragon eyes which are slitty and smokey. He's very lonely because he is the very last dragon. He once had a huge, noisy family but his Mum and Dad grew old and died and he ate the rest of the family! The dragon doesn't like water at all. Can you guess how Tashi tricked him? Read about it in Tashi. Tashi has fifty-six aunties, but Li Tam is his favourite. She has the most interesting house in the village, with rooms decorated with painted scrolls and delicate bowls and vases, as well as hand-carved swords which belonged to her father. In Tashi and the Ghosts, the Wicked Baron tried to make poor Li Tam move out of her house. But daredevil Tashi had a clever solution! Chintu is as big as two houses put together. As big as a mountain, with tufts of hair which look like spiky trees. He is so tall he casts a shadow over the whole village. Chintu promised to cook Tashi up in a tasty fritter, but Tashi had a clever escape plan involving some yummy dumplings! You can read about it in Tashi and the Giants. Chintu has an Only Brother who is even worse than him! He is almost as wide as he is tall, swells out in the middle as if he has a hill under his jumper, and eats and eats and eats all day. You can read about Only Brother in Tashi and the Big Stinker. The Princess is very pretty – shiny and special, like the first evening star. Tashi blushes a lot when Sarashina and her sister, Hoiti-Toiti, are around. In Tashi and the Demons, Sarashina was taken prisoner by two horrible demons who frightened away her guards and dragged her from her traveling coach. It was up to Tashi to sort out their demons with their snakes and rats and spiders! But then in Tashi and the Dancing Shoes, Uncle Tiki Pu took Tashi to the Emperor's Court to make their fortunes, and the Princess had to rescue Tashi! You can read more about Princess Sarashina, a wedding, and a very cunning plan involving a carpet, in Tashi and the Phoenix. Tashi found the genie sleeping in an old bowl in the shed, twenty-five years and ten minutes after the genie's last master had let him go. He was a very drowsy genie, and not very good at granting wishes. When Tashi wished for a flying carpet, the genie snapped his fingers and produced a magnificent carpet, which was smooth and polished as skin and patterned with hundreds of tiny peacocks with eyes glowing like jewels. But the carpet didn't work as expected! Find out what happened when Tashi wished to meet his Uncle Tiki Pu, in Tashi and the Genie. Tashi thinks Lotus Blossom is a pest, more annoying than a wasp in summer! She likes to know things other people don't, she always has to have the last word, and she hates missing out on anything. But Lotus Blossom is Tashi's cousin, and so she is precious. She's a very fast runner – nearly faster than Tashi! – and can sneak into tiny places to hide. She also has some good ideas, and in Tashi and the Haunted House, she helped Tashi save the day by making some very, very spooky sounds. In Tashi and the Dancing Shoes, Lotus Blossom disappeared, and Tashi went on an extraordinary adventure to save her. Baba Yaga is an old lady who lives in a house with scaly yellow chicken legs and a crooked chimney. The house has wings, too, and a storm blew it over the mountains and into the forest near Tashi's home. Baba Yaga has teeth made of iron and she likes to eat Boy-baked-in-a-pie! Find out how brave Tashi tricked her and got away in Tashi and the Baba Yaga. Jack's uncle is a brave traveler who knows about secret jungles and famous fishing spots. He always has a story to tell, on any subject at all. Do you think Uncle Joe is at all like Tashi's uncle, Tiki Pu? Angus is in Jack's class at school. He has glasses and dark hair. He's really interested in Egyptian mummies, and draws them all over his books, and people’s arms. He also draws jackal masks, which look quite spooky. In Tashi and the Mixed-Up Monster, Arthur Trouble drew a rude picture on the board with chalk, and Angus got the blame for it. Jack had to decide whether or not to tell the teacher the truth. When Tashi met Bluebeard, all the other evil men he had met before seemed gentle in comparison. Bluebeard was so full of venom, he could kill a snake. He had a deep, harsh voice and was very wealthy. Bluebeard bought the castle on the hill, with 23 bedrooms. 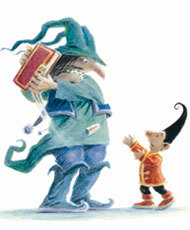 Can you guess how Tashi helped to rescue his cousin Ho Hum from Bluebeard? Read about it in Tashi and the Forbidden Room.